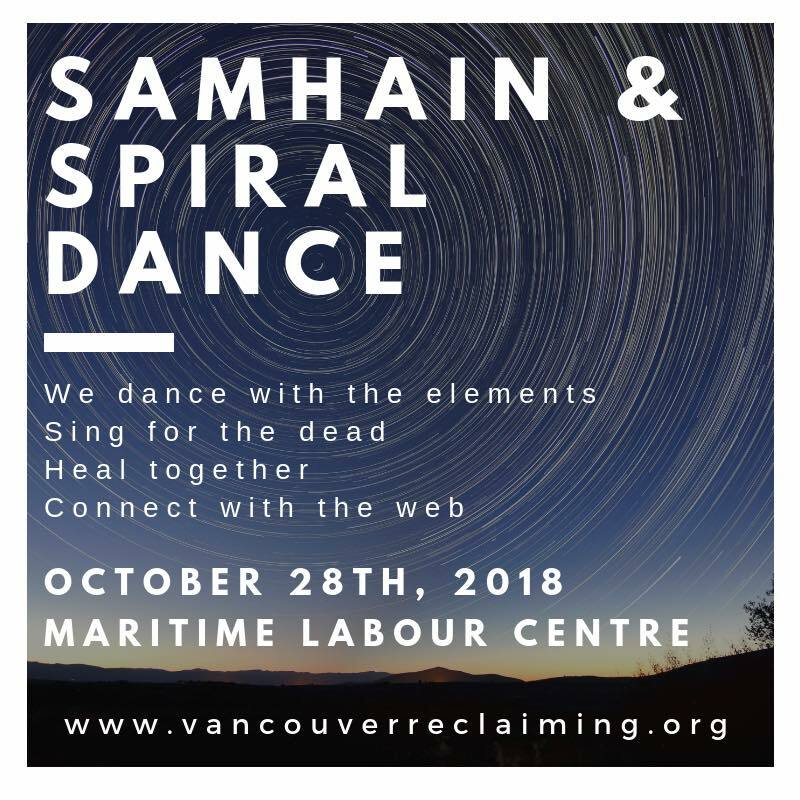 You are invited to join Vancouver Reclaiming for our 26th Annual Public Samhain Ritual and Spiral Dance. We respectfully acknowledge that this ritual is being held on the unceded territories of the xʷməθkʷəy̓əm, sḵwx̱wú7mesh and Tsleil-Waututh Nations. Samhain has Gaelic origins and was first celebrated in Ireland, Scotland and the Isle of Man. Learn more about Samhain. 7:00pm: Doors closed. SORRY NO LATECOMERS! 10:00pm: Ritual ends and food is shared. Please plan to stay until the end of the ritual. If you need to leave early please connect with a volunteer at the event. Tickets: $15 to $25 sliding scale (children under 12 free). Link to purchase tickets online: coming soon! Vancouver Reclaiming Rituals are drug, alcohol, and fragrance free! 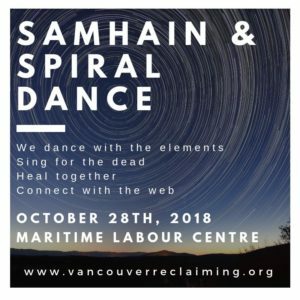 Is this your first time at a Reclaiming ritual, or Samhain? This is a great opportunity to get some brief info and have your questions answered. We are committed to Samhain being welcoming and accessible and have invited feedback with a survey held after our 2016 and 2017 events. Please continue to provide us with feedback and watch the Facebook event for our 2018 survey. Wheelchair accessible entrance, seating areas, and washroom. Moderately padded chairs for seating for elders and people with access needs in the ritual space. Reserved seating close to the ritual for those who are hard of hearing. Free street parking available throughout the neighbourhood. Buy your tickets in advance or bring cash to the door. There is no ATM onsite. In order to support the attendance of those with allergies and sensitivities to chemicals, please refrain from wearing colognes, perfumes, essential oils or other scented or chemical products to the event. No smoking within 10 feet of the event entrance. Scent-free soap will be provided in the washrooms. This audit of the Maritime Labour Centre was originally performed by the Radical Access Mapping Project in August 2011. For questions please contact rampvancouver@gmail.com.